Multiple choice questions are some of the most common questions used. 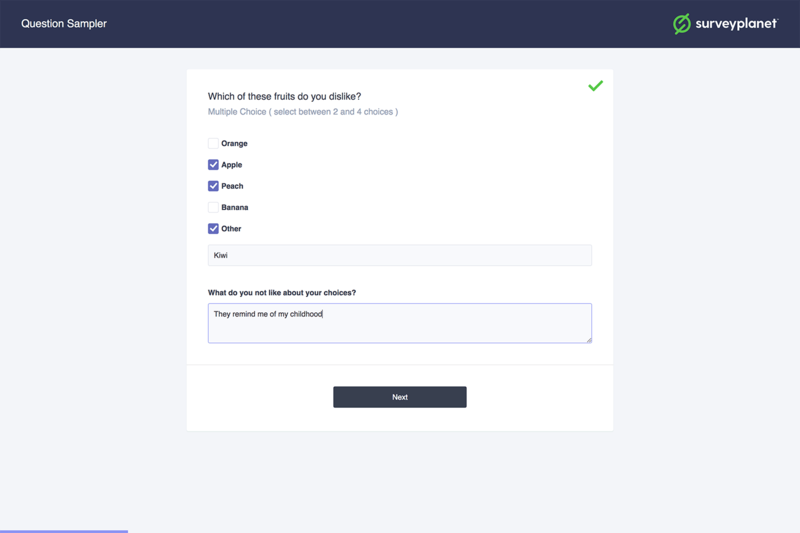 They allow you, as a survey maker, to let your survey participants choose from only options you give them. You can have as many option answers as you would like and make it so participants can only choose one or choose several. With multiple choice questions, you can offer as many choice options as you would like for answers, but you must have at least two choices. 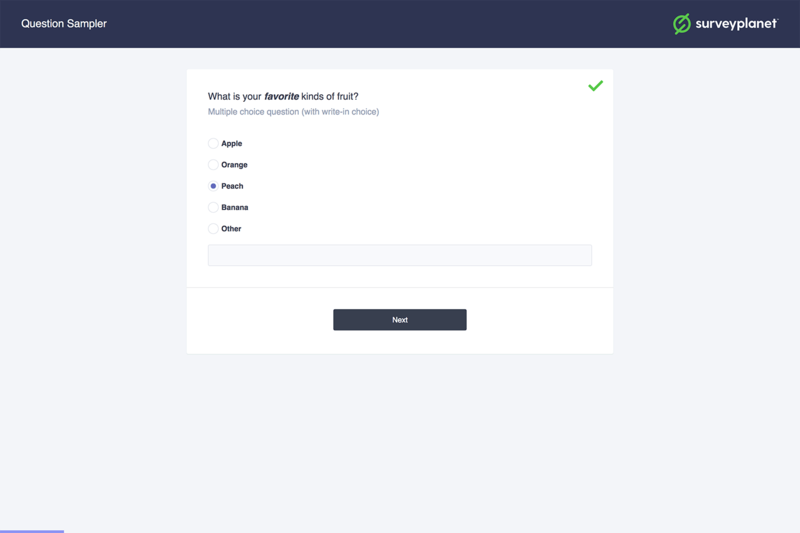 Each multiple choice question also has the option for multiple answers, randomizing the order of the answers and including a write-in option as one of the choices. Just click the corresponding checkbox below the choices. Click in the New Choice input field. Type in your first answer choice. Click in the second New Choice input field. Enter in your second answer choice. As you type in the last visible choice input, a new one will display beneath it. After two choices are entered, you do not have to enter any more. If you need more than two answers, continue to repeat steps 1 and 2 until you have entered all the choices you need. From the Question List page click New Question. Under Question Type select Multiple Choice. Copy your list of choices making sure that each choice is separated by a new line. Right click on the text input field with the placeholder text New Choice and select Paste (⌘-P Mac, CTRL-P PC) from the contextual menu. Note: This feature does not work in Internet Explorer. Hover over the choice you want to delete. An X will appear on the right side. Click the X to delete that choice. Hover over the choice you want to move up or down. A Move icon will appear on the right side. If the question you are asking needs the option for the survey participant to select multiple answers, you can do so by clicking the checkbox next to Select Multiple underneath the choices. Once you do this, you’ll see two new options: Min (minimum selections) and Max (maximum selections). In the Min input field, enter the minimum number of answer choices you want the participant to choose. In the Max input field, enter the maximum number of answer choices you want the participant to choose. So if you want the participant to choose between 3-5 answers, then you’ll put 3 in the Min input field and 5 in the Max input field. If you want to have the answer choices randomized each time someone takes the survey, click the checkbox next to Random Order. If you want someone to be able to write-in an answer option, click the checkbox next to Write-In Choice. A new input field will display below the write-in choice option. Here you can type "Other" or some verbiage that lets your participants know they can write-in their own answer choice. If your participants select this box from the answer choices, they can then write in their responses. You can also choose a display Layout for your answer choices. If you have a lot of answer choices, listing them all in one long column can look messy. You can choose to have your answers displayed in 1, 2, 3 or 4 columns or as a drop down list. If you use a drop down list, your survey participant can only select one answer, you can not randomize your answers and there is no write-in option.